Ballad singer Zhao Lei is popular around China because of his song Chengdu. What touches listeners is not only the moving melody, but also the lyrics, which depict the inclusiveness and softness of the city. Chengdu, capital of Sichuan province, has always been a paradise for musicians. A three-day Cactus Music Festival, part of the 24th Autumn in Chengdu 2018 Chengdu International Music Season, was held during this year's Mid-Autumn Festival, attracting renowned rock stars such as Cui Jian, Zheng Jun, Black Panther, and the Tang Dynasty Band. From the 20-year anniversary tour of the classic original Broadway musical Rent, to German Brass' performance, to a large-scale concert themed A Dream of the Red Mansions, this year's season provided more than 200 music shows and outdoor music activities over 48 days. It aimed to create a musical experience and festival with the distinctive features of Chengdu. More than 100 street artists put on scheduled or flash performances in streets and alleys, infiltrating street music into the lifeblood of the city. The 2018 Chengdu Music Culture Industry Expo was held at the same time. The event was staged on an exhibition area of 30,000 square meters, and attracted more than 400 Chinese and foreign companies from the musical instruments, music education, lighting and acoustic instruments, and stage machinery industries. A Chengdu music industry investment and financing roadshow was also held, which led to signing of contracts for 11 musical industry projects and a total investment of 11 billion yuan ($ 1.6 billion). Chengdu is now continuously pushing forward the development of its music industry on its quest to become a world music capital. In addition to the Autumn in Chengdu Chengdu International Music Season and the Chengdu Music Culture Industry Expo, it is host to 1,000 music events of different sizes. High quality musical experiences cannot be staged without proper venues - Chengdu has launched a plan to build high-standard large and medium scale performance facilities and city music parks, which it hopes will become world-renowned landmarks and mark its status as a center for world music. It was recently announced that two new music venues - a Chengdu music hall and the Fenghuang Mountain park for music - will soon be available. According to Zheng Shang qin, president of Chengdu City Construction Investment & Management Group, the construction of the city music hall will be finished later this year, its first performance to be staged by the end of the year or around New Year's Day in 2019. The city music hall will consist of an opera hall, concert hall, theatre hall, small indoor concert hall and supporting facilities. The four halls will respectively hold 1,600, 1,400, 400 and 300 seats. The Fenghuang Mountain open music park will be located at the junction of Xiongmao Avenue and third Ring Road on a total area of 370,000 sq m.
According to Zheng, the park will be able to accommodate 50,000 people, and include a theatre able to host concerts for as many as 10,000 people, half of them indoors. According to Shi Jiang, head of the Chengdu Culture, Radio, and TV, Press and Publication Bureau, Chengdu aims to speed up its growth as a production base for original Chinese music, music facilities, an equipment and instruments distribution center, a music copyright exchange center, a performance venue and a destination for music leisure tourism. 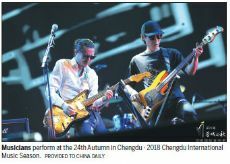 Chengdu set out a three-year plan of becoming a world music capital in September. The plan calls for more than 30,000 indoor music performance venues to be in place by 2020, with more than 30 international music events scheduled. The city's music industry output value is expected to exceed 57 billion yuan ($8.3 billion), with an annual increase of over 20 percent. Shi said that to accelerate its emergence as a world music capital, Chengdu will nurture musical talents, incubate original music, upgrade entertainment carriers, build music brands, enhance the music industry, strengthen market entities, and optimize spatial arrangements. Domestic and international music companies, talents and projects are already moving to Chengdu, which is now home to over 400 important institutions and music-related companies such as Migu Music, iQiyi, and KuGou, as well as recording studios of famous singers.